MGHM collaborates with four soup kitchens in poor neighborhoods in Chone, Ecuador. In these soup kitchens, we serve over 200 children, disabled people, and elderly people every day. In 2009, we started to set aside a part of the produce from Maria Elisabetta Farm for the soup kitchens to enrich the nutritional value of the food we give. Fresh products from our farm are brought to the soup kitchens every week: meat, chicken, vegetables and fruit. In 2015, we started to take steps to open a new soup kitchen in Isla Trinitaria, a very needy part of Guayaquil, lacking even the most basic needs. In December 2016, we officially opened the soup kitchen in a building that belongs to the parish of Isla Trinitaria. Now we distribute meals to 100 children, disabled people, and elderly every day. We have also started to visit a very poor parish in a neighborhood called Flor de Bastión in the outskirts of Guayaquil. 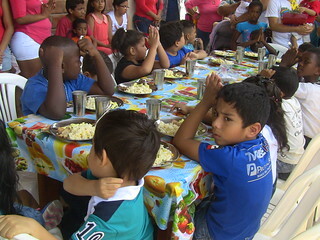 We have set up a make-shift soup kitchen and give lunch to poor children every Saturday. It may be the most consistent meal they eat all week. 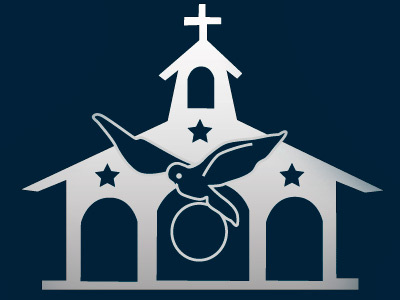 We hope to build catechism classrooms and a soup kitchen in this parish. See below for more updates on our soup kitchens. Help us by helping fill a can. You can put the can in your house, your parish or your school! The money goes directly to the soup kitchens to help feed the poor children in Chone, Ecuador.